Above photo: The final installation of “Generation Dandelion.” Photo by Jen Saffron. This past summer, Angelina Rejametova, 17, worked with eight other teens as junior apprentices in the annual Mobile Sculpture Workshop. 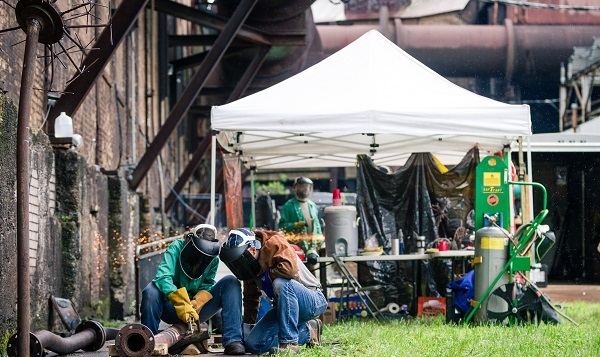 Working to sculpt and weld a piece of public art – this year in Hazelwood – they started generating the design by meeting with the residents at a community meeting. 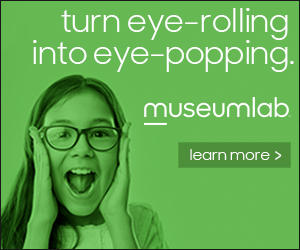 From that initial brainstorming session, Angelina thought over all the ideas her neighbors wanted to see in a sculpture, from brightness to a connected sense of community. As a child growing up in Hazelwood, Angelina thought it was a flower, a stubborn one at that. A dandelion doesn’t go away even when you pick it. It’s rooted deep. 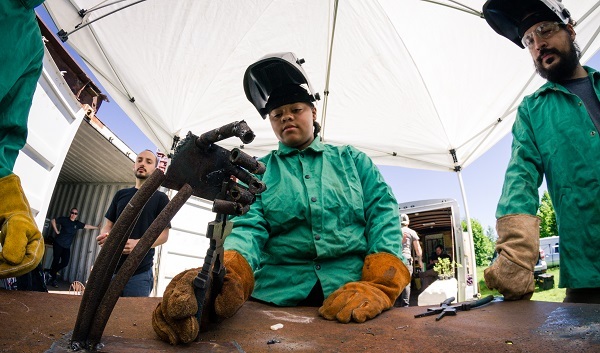 Teens learned confidence along with welding skills during the Mobile Sculpture Workshop. The idea developed into the 14-foot-tall sculpture, “Generation Dandelion,” which took four months of sparks flying to build from recycled material. The piece was created for the Center of Life and was installed this past week in front of the former Gladstone School in Hazelwood. It resembles a dandelion gone to seed, waiting to be blown into the breeze. The project stands as a model of the craftsmanship and skill level developed over the five-year history of the Mobile Sculpture Workshop, an outreach of the Industrial Arts Center. Past workshops produced a number of inventive pieces: A flying bird sculpture in front of Propel Elementary School. An archway for a community garden in Larimer. A yet-to-be-installed giant book for Braddock library. And a giant rocking horse for the Spring Hill Community Group. Teen junior apprentices worked with professional mentors for the four-month workshop. 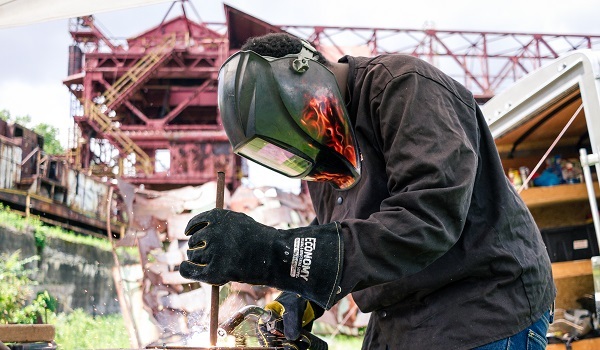 During each summer workshop, six artists, technicians and teachers – comprised of metal workers, welders and sculptors – work with 10 or so junior apprentices. The group of mentors organized to serve the community and create opportunities for artists, while engaging local kids. Teens learn basic safety and welding techniques during weekly workshops. At the end, they receive a small stipend for their work. “The most exciting aspect is their sense of camaraderie and the team building aspect,” says sculptor Tim Kaulen. Working on the road means lugging heavy equipment and tents from space to space. Without a permanent home studio, the “mobile” part of the name goes into effect. The group takes their work on the road to festivals and neighborhood events where people could see art while it’s being made. 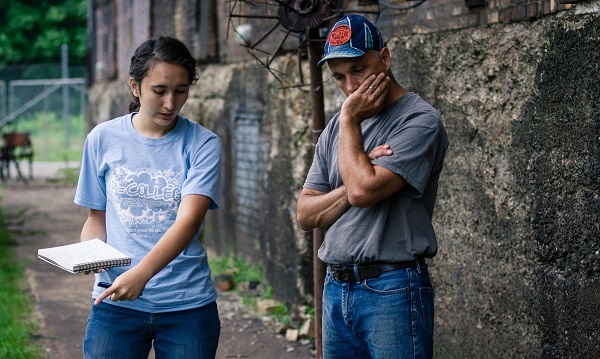 Angelina Rejametova and Tim Kaulen discuss plans for the project. 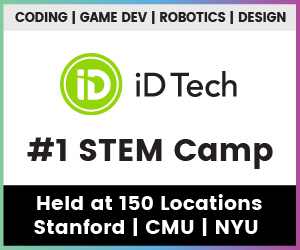 Beyond the artistry and fun of learning new techniques, participating in the Mobile Sculpture Workshop has helped define career goals for some teens. Madelynn Farkas, an apprentice in 2017, returned this year as part of the crew. She recently got a job with the Steamfitters Local #449. Dante Greene, 16, a junior at Taylor Allderdice High School, has taken jewelry-making classes for three years. His apprenticeship expanded those basic metal-working skills. Now, he hopes to join the U.S. Air Force welding program, just like his uncle. “This had a major impact on me,” he says. 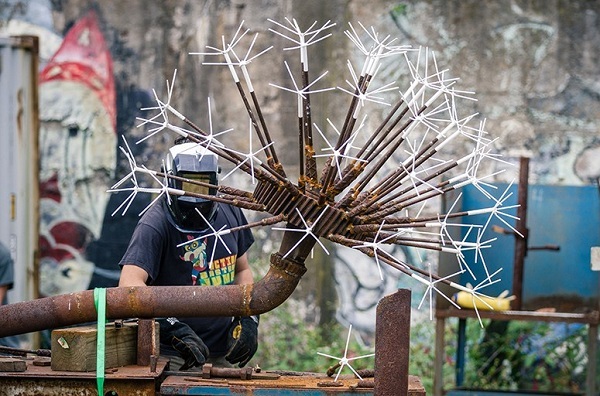 The 14-foot-tall sculpture called “Generation Dandelion” nears completion.